6-20 feet tall with up to a 10 foot spread, depending on the species and cultivar. They have glossy, dark green, 2"-4" foliage that is attractive even when the plant is out of bloom. from October through March, but in colder regions they may not bloom until late spring. Camellia flowers are classified according to their size and form. The flowers may be miniature (under 2½"), medium, large or very large (over 5"). They may be single flowers, semi double, Anemone-form, Peony-form, Rose-form double or Formal double. The flower colors range from pure white to deep, dark red and there are even some bi-colored varieties. it is a good idea to select and purchase Camellias when they are in bloom. There are over 300 different species of Camellia, but the majority of those that are commonly available are hybrids of Camellia japonica or Camellia sasanqua. 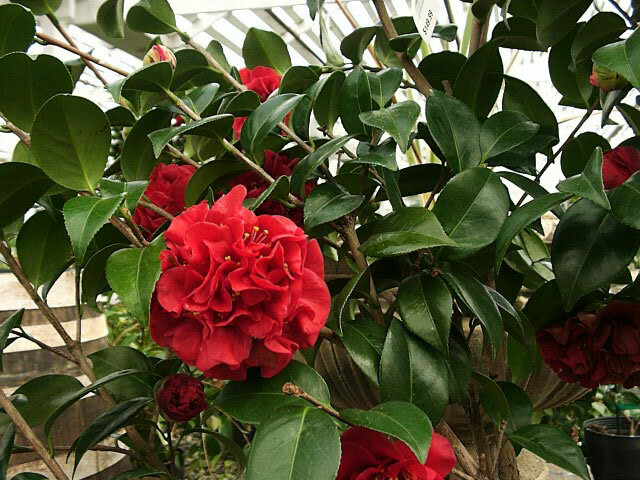 Japanese Camellias, Camellia japonica typically form pyramid shape, and have leathery 4" leaves with serrated edges. They slowly grow to 10-15 feet tall. The 2"-5" flowers appear singly at the end of their branches. only growing 6-10 feet tall and have a more open growing pattern with fuzzy stems. They will tolerate a little more sun than Japanese Camellias. 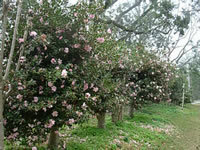 Most Camellias are hardy in USDA zones 7-10. 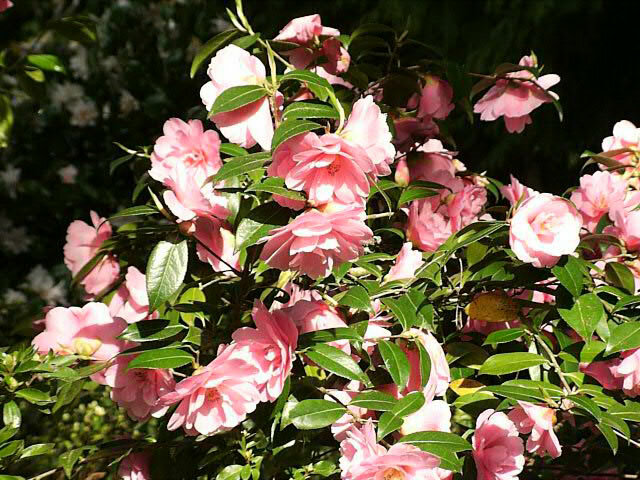 Camellia plants should be grown in partial shade, but they will tolerate some morning sun. Full sun will burn the foliage, but full shade will reduce flowering considerably. White and light pink flowering varieties require more shade than dark colored ones. Camellias require well-drained, slightly acidic soil with a pH of 6.0-6.5. The soil should be kept evenly moist at all times, but especially when they are in bud or in bloom. Rhododendron type fertilizer applied sparingly around the drip line of the plant. Always water fertilized plants thoroughly after the application. 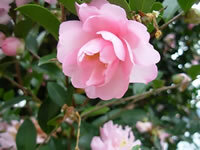 Spreading fertilizer directly beneath Camellias can result in burning the shallow, tender new roots. Always follow label directions carefully! immediately after blooms fade or in mid-summer. Remove weak, spindly or dead branches. Thin out the inner branches and shorten lower limbs to encourage upright growth..
Camellias should be planted or transplanted during the fall and winter months. 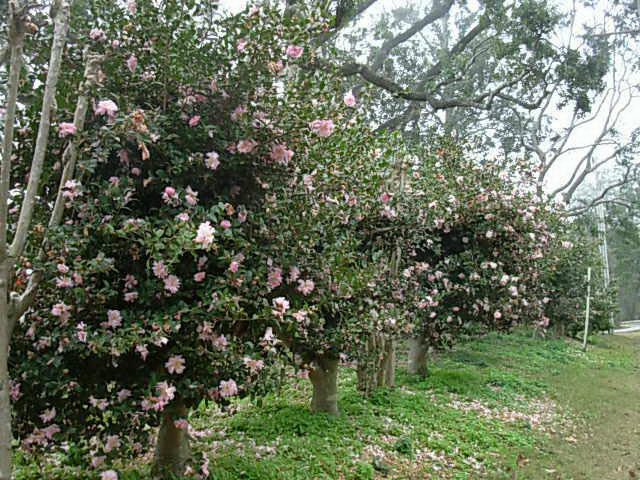 The planting depth is critical for Camellias. If the root ball is set too deep, your Camellia may refuse to bloom. compost or processed manure with the existing soil. Dig the planting hole twice the diameter root ball and about 1½ the depth. will be about an inch above the existing soil level, to allow for settling. Place the plant into the new planting hole and add the remaining soil, tamping it down as you fill. Water heavily, to settle the soil and remove air pockets in the soil. Keep well watered until your Camellia is well established. Add a thick layer of mulch (2"-3" of leaf mold or shredded bark) to help maintain moisture. 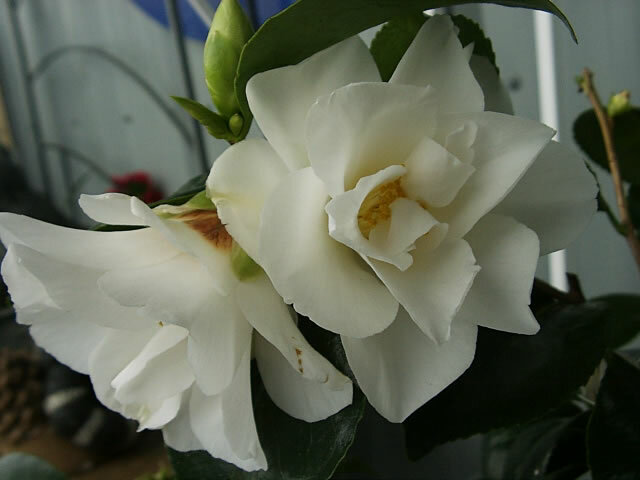 The fastest and most reliable method of propagating new Camellia plants is by air layering. This method will allow you to create much larger clones. Air layering of Camellias can be done at any time of the year but the best results are accomplished if the process is done in the spring when the plant is actively growing. Camellias can also be propagated with softwood cuttings taken from new growth in early summer, but it is a slow process. Each cutting should have at least 5 nodes. before inserting the cutting into a sand/peat moss mix. Camellia seeds harvested from hybrid plants may be sterile, and those that are viable may produce plants that are not true to their parent. Soak Camellia seeds in warm water for 24 hours before sowing them indoors during the spring or fall. Maintain a temperature in the growing medium of 70°-75° until germination, which takes 1-2 months.